In America, naming rights for theatres and concert halls aren’t just an honour, but something to be bought, sold and traded. In 1973, Avery Fisher, an electronics magnate, made a $10.5 million donation to have the largest concert hall at Lincoln Center named after him in perpetuity. But in 2015, his heirs were bought off for $15 million to enable the venue to accept a $100 million donation from David Geffen to have the name swapped over to his. Hey presto! It is now the David Geffen Hall. We’ve seen something similar here when the National’s Cottesloe Theatre – named after a former chairman of the theatre – was redubbed the Dorfman in 2014, after Travelex boss and philanthropist Lloyd Dorfman donated some £10 million towards the NT’s redevelopment, which included an overhaul of the Cottesloe. Money talks and some philanthropists and businesses like branding opportunities. When impresario Garth Drabinksy created a new venue on the site of Broadway’s former Apollo and Lyric theatres, it opened in 1998 as the Ford Centre for the Performing Arts. It subsequently became the Hilton and then the Foxwoods Theatre, before finally reverting to one of its original names, the Lyric, in 2014 after ATG bought the theatre. But corporate branding hasn’t disappeared from 42nd Street: further along the same street, the Selwyn long ago became the American Airlines Theatre. In London, the Royal Court’s two theatres were both renamed for the Jerwood Foundation that donated to the theatre’s 1990s refurbishment. The Hammersmith Apollo has, over the last 20 years or so, variously been named the Labatt’s Apollo, the Carling Apollo and the HMV Apollo, and is now the Eventim Apollo. But we’ve also seen, in the West End and on Broadway, a flurry of theatres being renamed to honour personalities. The Globe on Shaftesbury Avenue long ago became the Gielgud, which resolved a potential confusion for tourists after the recreation of Shakespeare’s Globe opened on the South Bank. Cameron Mackintosh renamed the Strand and Albery Theatres for Ivor Novello and Noel Coward respectively. 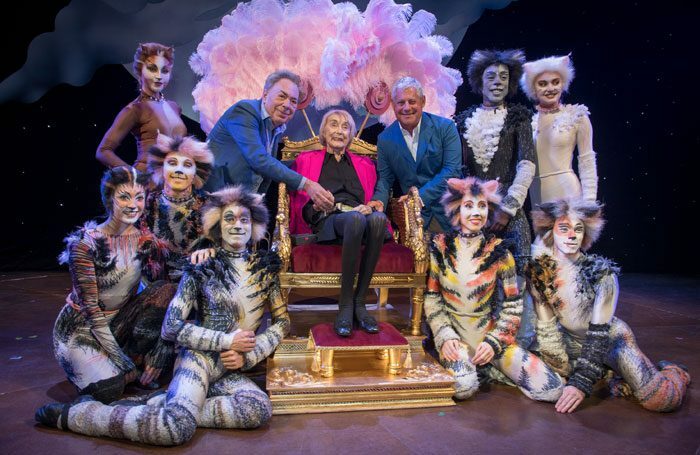 Last week, Andrew Lloyd Webber formally changed the name of the New London on Drury Lane to honour Gillian Lynne, the first choreographer to be thus celebrated, at a theatre where her most famous work, Cats, had a 21-year run. It was a gracious gesture, though slightly undermined by a film company announcing a new screen version of Cats the day before that would be newly choreographed by Wayne McGregor. Theatre is not just about the future but also the past. Sometimes theatres invoke it again: last week West Yorkshire Playhouse announced it will be known again as the Leeds Playhouse, the name under which it originally opened as a temporary space in 1970, following a £15.8 million capital redevelopment project.